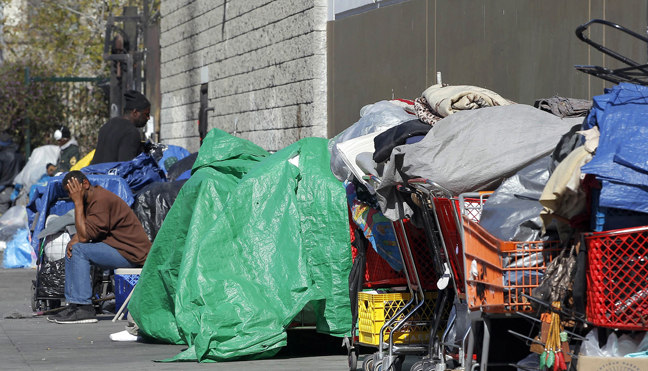 LOS ANGELES (CNS) —Poverty went up in the Los Angeles area last year while the median household income remained statistically unchanged, the U.S. Census Bureau reported today. The bureau also found that Los Angeles-area residents pay substantially more for homes and rental units than in the rest of the nation and that about 34 percent are foreign-born, compared to about 15 percent in the rest of the United States. In terms of education, more L.A-area children who are 3 and 4 are enrolled in school than in the rest of the nation, but the Southland is behind when it comes to high school graduation rates. The Census Bureau said in a statement that its 2012 American Community Survey showed 17.6 percent of people in the Los Angeles area were in poverty in 2012, an increase from 17 percent in 2011. At the same time, 20.9 percent of the area’s population lacked health insurance coverage, a decrease from 21.2 percent in 2011, and the median household income was $57,271, which was not statistically different from $57,745 in 2011, the Census Bureau reported. Across all U.S. metro areas, median household income was $53,607 in 2012, the poverty rate remained at 15.5 percent, and the uninsured rate decreased from 15 percent to 14.7 percent, it said. • In 2012, 53.9 percent of 3- and 4-year-olds were enrolled in school, which was not statistically different from 52.9 percent in 2011. Nationally, 48.7 percent of 3- and 4-year-olds living in metro areas were enrolled in school in 2012, which was not statistically different from 48.4 percent in 2011. • Among the Los Angeles area’s 25-and-older population, 78.8 percent had completed high school or more in 2012, an increase from 78.1 percent in 2011. Among all U.S. metro areas, 86.7 percent were high school graduates or higher, an increase from 86.3 percent in 2011. • Of the Los Angeles area’s 25-and-older population, 31.8 percent had a bachelor’s degree or higher in 2012, an increase from 31 percent in 2011. Nationally, 31.2 percent had a bachelor's degree in 2012, up from 30.6 percent in 2011. • In 2012, the median value for an owner-occupied home in the Los Angeles metro area was $428,500, a decrease from $439,200 in 2011. Across all U.S. metro areas, homes had a median value of $188,300 in 2012, a decrease from $191,000 in 2011. • In 2012, the median gross rent — rent plus utilities — was $1,233, not statistically different from $1,236 in 2011. Renters in metro areas across the U.S. paid $925 in 2012, not statistically different from $927 in 2011. • About 33.9 percent of Los Angeles area residents were foreign-born in 2012, which was not statistically different from 34.1 percent in 2011. Among all U.S. metro areas, 14.8 percent of the population was foreign-born, not statistically different from 14.7 percent in 2011.